I am very excited to find your West Virginia Website! 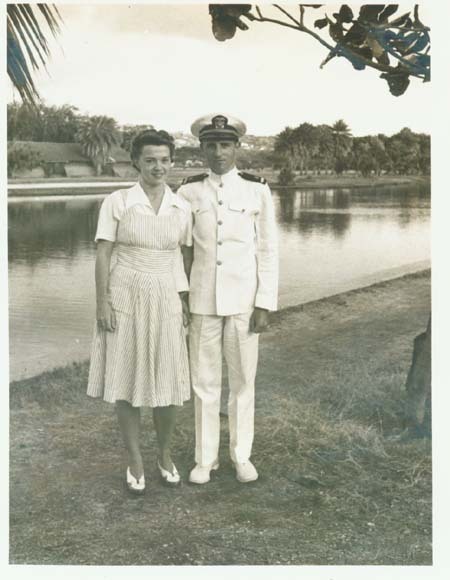 My father was a gunnery officer and was stationed at Pearl Harbor from 1940 until 1945. After the WV was sunk my father was reassigned to the Fleet camera party as camera officer. Although my dad died in 1952 my mother has told me much of the attach and ot the many friends that they lost. I also have several photographs of the West Virginia during the 1942 efforts to refloat her and earlier photos of the battleships during offshore gunnery practice, and a bunch of crew photos (both officers and enlisted, some with id of the personnel. I will get you some copies of the photos or I can e-mail them, please let me know what works best. Howard Sephton was my father. He was commissioned an Ensign on November 14, 1940. He and my mother were married the next day. After their honeymoon, he reported to Long Beach, CA, where he sailed for Hawaii on the WeeVee. A few months later, my mother joined him. Both were there on December 7th and I was born there in March of 1943. I have a great deal of info re my father and events of that time. Pictures? Camera Party! I have many photographs, original Honolulu newspapers dated December 7th including numerous "Extras," and letters h my parents wrote home. employed at his Alma Mater, Alfred (NY) University, doing research for the Navy Dept! He was recalled for the Korean conflict, based in Washington, DC, and we moved to Arlington, VA. In early 1952 he was admitted to the Navy hospital in Bethesda, MD, where he was diagnosed with a malignant brain tumor. He died in June of 1952 and was buried in the National Cemetery on Long Island. His rank at that time was Commander. He was only 37 years old and left behind his wife, myself, age 9, and two sons, ages 7 and 3. My mother remained a widow for 30 years before remarrying. Howard Sephton and his wife.